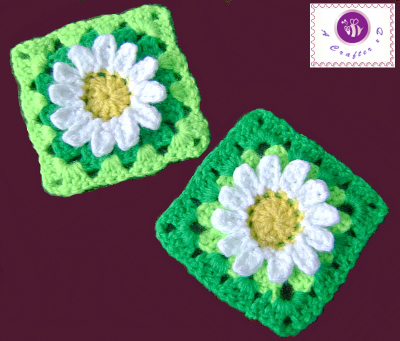 This crochet daisy flower is another version of the daisy applique pattern I made. Wild daisy is rather small and humble but I know many love it. 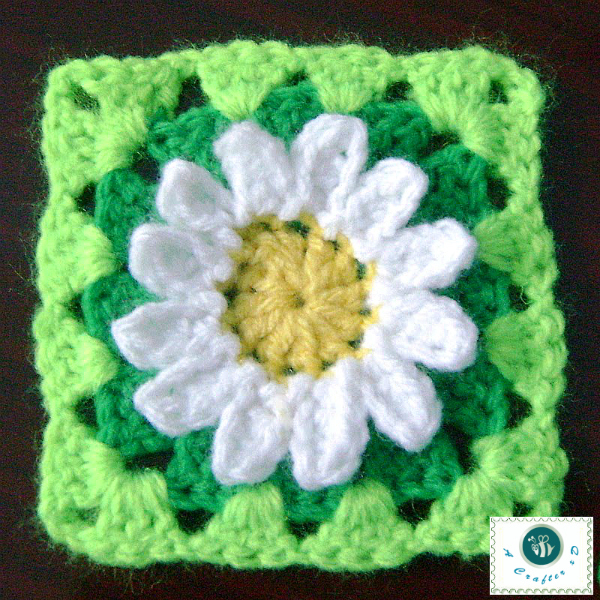 The 3D crochet wild daisy granny square pattern is crocheted continually from the flower to square bed. 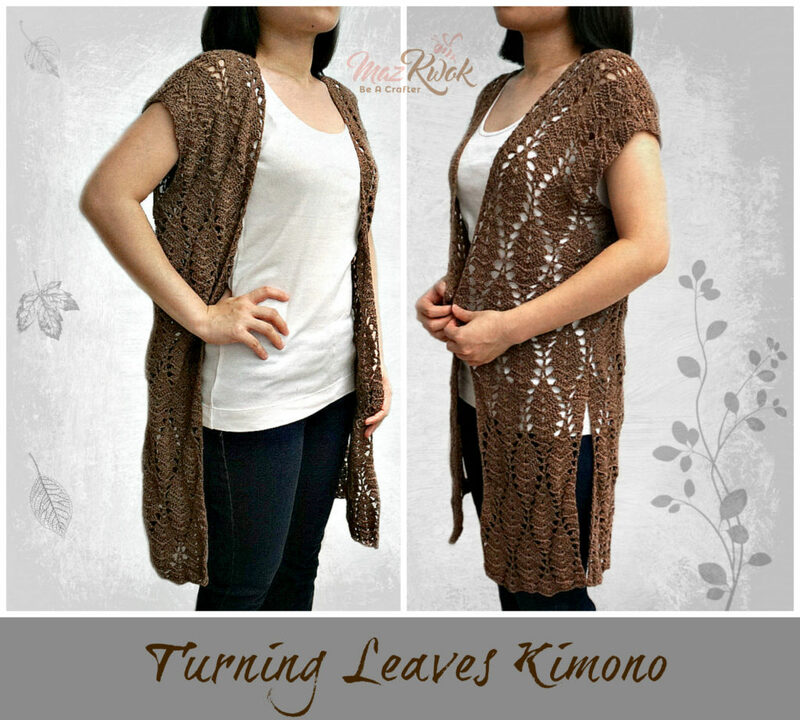 This pattern can be made with any hook size, choose a yarn type that matches your hook. Steam block your finished squares. Start with yellow yarn to make flower’s pistil part. Form a magic ring, 12 dc into the ring (fasten off), total 12 sts. 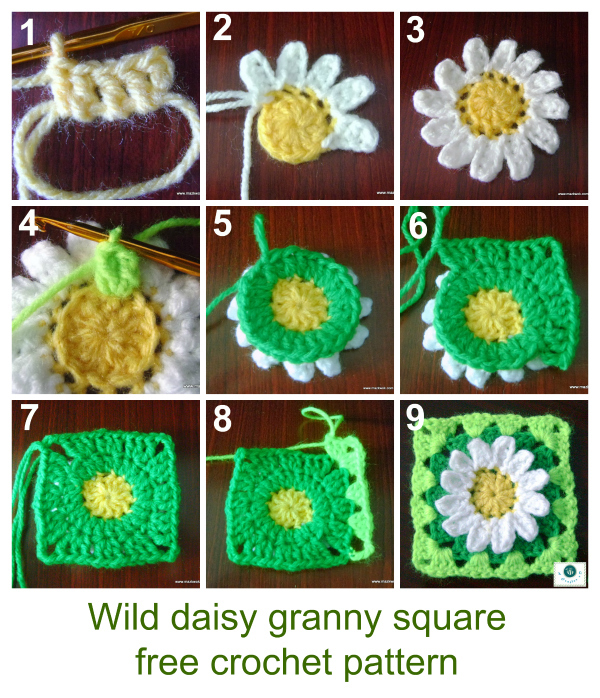 R1: Now work into back – loop stitches behind the flower. Use green yarn, join yarn into any back – loop st, inc dc into every st around, total 24 sts, sl into 1st to join. R2: tr, 2 dc into same st, ch 1, skip 1 st, 3 dc into next st, ch 1, skip 1 st, 2 dc into next st, tr into same st, ch 3, skip 1 st, *tr into next st, 2 dc into same st, ch 1, skip 1 st, 3 dc into next st, ch 1, skip 1 st, 2 dc into next st, tr into same st, ch 3, skip 1 st* repeat ** 3 times around, sl into 1st st to join. That’s it! What should I do next with these flower squares? Blanket, throw, bag or pillow case… whatever… If that’s in your mind, too. I think there’s one online class you might want to watch: Joining Crochet Motifs with many joining techniques and tips to learn. Hi there! So, I’ve been trying to do the square pattern now for 2 days and I just can’t get it to work. When you say 3 dc in next two stitches, does that mean crochet those two stitches together? Or does it mean 3 dc in each of two next stitches? I’ve done both and the second interpretation left me with about 4 stitches leftover from the original circle. Can you help me? OOOOOH! Well, I made it work via a series of I don’t even know what’s. I”ll try it your way next time. 🙂 Thanks so much!!! !